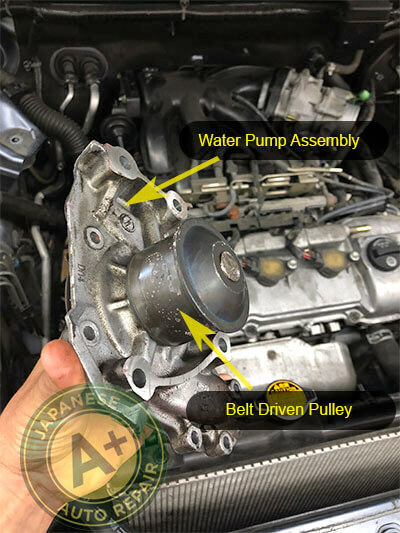 San Carlos Water Pump Repair - A+ Japanese Auto Repair, Inc.
A+ Japanese Auto Repair Inc. is a family owned and operated Auto repair and service facility who are water pump repair and water pump replacement experts. We have been specializing on water pump and cooling system repair since 1997. We provide the same level of water pump repair, service, and parts at a lower price than the local dealership. Our staff is available to answer any questions you have about cooling system or water pump repair. For answer to questions about water pump repair or replacement, contact us at (650) 946-1856. If you are ready to book an appointment for water pump replacement click the book here button below. How long does the water pump last in the car? The water pump should last between 7-10 years before it needs to be replaced. Typically, the water pump should be replaced when you see signs of leaking or when you are replacing a water pump that is driven by the timing belt. How much does the water pump cost to replace in the car? The water pump replacement will cost can range from $250 to over $1000. It will cost less if the water pump is easily accessible and will cost more money if the water pump is located behind the timing belt covers. How do you tell if the water pump is going bad? You can tell when a water pump is going bad when it starts to leak from the “weep hole”, makes a howling noise from the pump bearing, or leaks coolant from the water pump shaft seal. The “weep hole” can only be seen from below the pump and will leak with the internal seal is worn or damaged. Sometimes it is every dry coolant is a sign that the water pump will need replacement. A bad water pump bearing or bad shaft seal will be more obvious when it starts to fail either by becoming noisy or leaking. A water pump’s main job is to pump and circulates engine coolant (anti-freeze) and water whenever the engine is running. 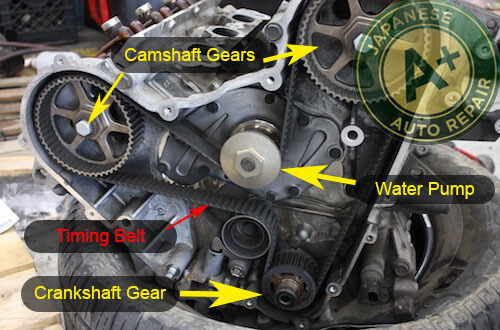 The water pump is driven be a rubber belt or gear, which is connected to the crankshaft of the engine. In fig.A you can see the front side of the water pump as well as the pulley that is driven by the flat side of the timing belt. The timing belt turns this water pump pulley which has a water pump shaft that attaches to the impeller of the water pump. The water pump is turning whenever the car is running which pulls in coolant/water and then pushes it out. The water pump is an important part of the cooling system and should be changed due to wear based on factory recommendations. If the water pump fails it can cause overheating and catastrophic engine damage. The water pump on today’s vehicles uses centrifugal force to circulate the fluids through the vehicles cooling system. The fluid that leaves the pump flows first through the engine block and cylinder head, then into the HVAC heater core, followed by the radiator and finally back to the pump. The only time the water is not flowing is when the thermostat is blocking the flow which helps bring engine temperatures up to normal operating temperature. Have questions about your water pump? Contact us today! How long does it take to replace the water pump? A water pump replacement will take 1.5 hours to 5 hours. The time that the water pump takes to replace is based on how difficult it is for the mechanic to access the water pump. Once the water pump is replaced, the coolant system will also take time to fill, bleed the air from the coolant, and check for water pump leaks. As shown in the photo below most of the vehicles we work on have a water pump that is run by a timing belt. That is typically the reason timing belt and water pump are replaced at the same time due to the overlapping labor the mechanic performs when replacing a "timing cavity" component. 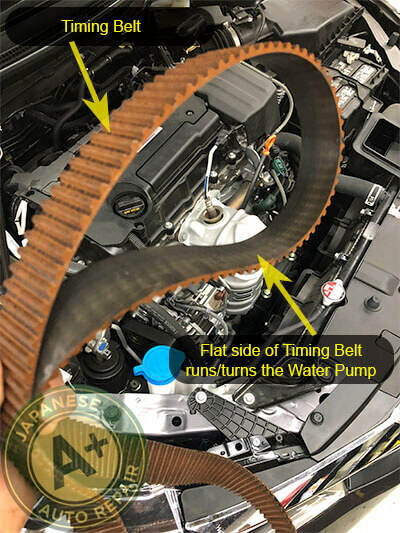 Some water pumps can also be driven by and engine drive belt instead of a timing belt. A water pump driven by a drive belt is typically a less labor intensive job to perform for an auto repair & service mechanic. The last thing to consider when changing a water pump is the cooling system has to be drained. Due to this the vehicle is typically refilled with fresh coolantt. Any cooling system hoses, thermostat/gasket, or other engine cooling related items that may have signs of wear can be changed at the same time since the coolant is already drained. This also helps save the cost of repairs over the life of the vehicle due to the overlapping labor performed by an automotive repair & service mecahnic. Can I drive with a leaking water pump? You should not drive with a leaking or damaged water pump. When the water pump is leaking, the vehicle will start to overheat. A leaking water pump could very well could cause major engine damage and leave you stuck on the side of the road with an overheating vehicle. When it comes to water pumps, not all water pumps are created equally. Original Equipment (OE) pump from the manufacturer guarantees a proper fit and seal of your water pump. Since it was built for your specific vehicle, you can expect it will last longer and be a better water pump! The vehicle manufacturer will update and supersede its parts in an on-going effort to improve parts and fix common issues. There are many benefits to using a high quality part that A+ Japanese Auto Repair offers. 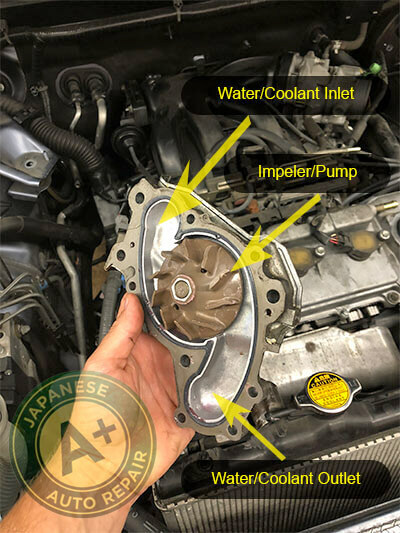 A+ Japanese Auto Repair Inc. uses the highest quality water pumps, thermostats, and related components so we can offer our clients a 24,000 miles / 24 month warranty on all vehicle repairs performed at our auto repair shop. 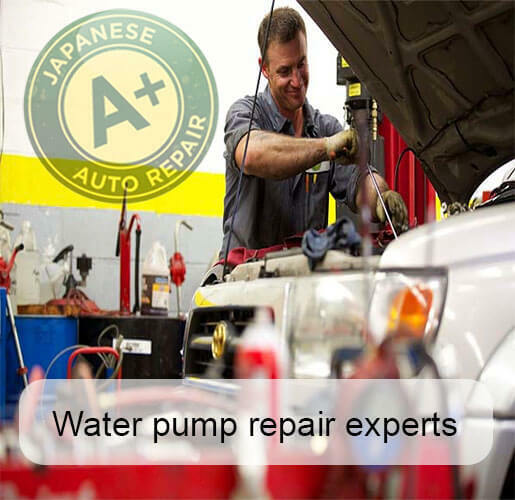 What type of water pump does A+ Japanese Auto Repair in San Carlos use?